We have coped better with only two winches than we expected. The boat sails best fairly upright (i.e. reef in good time) so there is less need to be ready for that quick wind spill on the mainsheet. Swapping over the sheets seems to become a habit quickly enough. We have a cruising chute, which works OK on just the two winches. Jeanneau do make a special bracket to mount extra winches on the combings but it looks so indescribably ugly, don't even think about it; you're stuck with two winches. Isolate the bathing platform shower using its stopcock by the gas bottles as scale build-up can cause a leak which you won't detect until all the water is gone. The drain of the ice box is just directly into the bilge so if you are not careful you can easily wash some revolting mouldering food residues into the bilge from where they can't escape and just get more revolting under the floorboards - not a great design feature. Also the non-return valve in the outlet pipe of the electric bilge pump is not perfect (they never are but the Jabsco ones seem better than the Whale which was fitted on our boat) The result of this is that you think the bilge sump is filling up but actually it's just the water in the pipe running back over 48 hours or so after you pump the bilge. This masks actual problems and is totally disgusting if it has rotting debris from the coolbox! I find the best solution is to periodically flush fresh water into the bilge and pump it out but them mop up the run back manually. When you know the bilge and the pipe are dry, if any water collects you know you actually have a problem. A GPS repeater at the wheel is a must. Also we have a multi repeater at the chart-table, which is very handy. I hook up my laptop computer to the NMEA/GPS output to upload and download waypoints. If you have SeaTalk you need Raytheon's little converter to produce NMEA. One wiring modification we made which was easy and handy was to split the five main saloon cabin ceiling lights into two switched circuits. I took off the unnecessarily large rocker switch which Jeanneau fits and put two physically smaller but adequately rated ones in its place (available from RS Components - see their website). 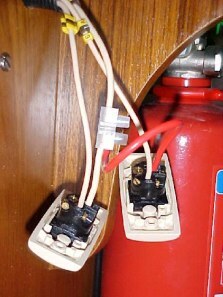 Very handily, the port lights (2) and starboard (3) lights are separately wired back to the switch by Jeanneau so it is ten minutes work to make two switched circuits out of one. The benefit is that you can avoid floodlighting all the washing-up when you're sitting with a cosy cup of coffee and vice versa. Overall we felt the five lights together were a little too bright a lot of the time. Saves battery power as well. One major problem we have when new was a seemingly incurable squeak from the wheel. Jeanneau had many boats like this and for a long time couldn't fix it. They eventually tracked this down (two sheaves above the small removable ceiling panels in the aft cabins - WD40 works). Interestingly, the 34.2 we rented in the Caribbean this winter had exactly this problem. Editor note: Careful with WD40 it may give only very short term relief, it tends to wash the grease out, better to disassemble and regrease. We have now fitted an electric anchor windlass (SL Horizon 900) having found it so convenient when we chartered a 34.2 in the Caribbean. We have decided the boat and the anchor are really too big for us to handle unaided - in a 25 knot wind and you'd like two strong men on the foredeck if you don't have a windlass. If you do fit one, Jeanneau make a special bracket for mounting a windlass which transforms the angle on the inside back face of the anchor locker to a horizontal surface. It's a dreadful looking piece of ironmongery, but since it's in the locker it doesn't matter. We had Sea Ventures make a bookshelf on the starboard side between the two cupboards above the seating (where you can have a hull port if you like extra holes in the hull). Also we had the nav table seat lid hinged (it's horrid in its detachable form). Lastly, we divided the cutlery door in two so that you can open the top half even when the sliding stool is in the out position. We have found all these very useful and wouldn't be without them. I also had Jeanneau put the battery charger in the space by the hot water tank, which is otherwise virtually useless, and this provides lots more useful space in the nav seat and prevents damage being caused to the charger by things like winch handles being dropped in on top of it. Externally I have treated the woodwork with Sadolin (light oak colour) which works well and is a fraction of the cost of similar yachting products. If you have the Yanmar it's a great engine but the cooling water impeller housing is virtually impossible to get to. This is Yanmar's fault for putting it back-to-front and virtually under the engine. I always make preventative maintenance by renewing it each Spring. I judge it would range from impossible to very difficult/time-consuming for an amateur to make a replacement at sea - even on a calm day. Our lazy jack system is still not perfect as the sliders are a bit stiff the sail never drops neatly into the bag. Also after two seasons the bag is virtually worn out. Its very flimsy - the sailmaker is patching it up at present to get a few more years out of it. The Jeanneau genoas used to have no UV sacrificial strip and our sailmaker strongly recommended we fit one (he said no Jeanneau's or Bavaria's are supplied with them and the Bavaria sails had started noticeably deteriorating after three years). He fitted a white strip for about £50. Because we occasionally charter the boat out it is up to DoT spec and has lee clothes under split cabin cushions in the aft cabins and the forehatch opening has been reversed to Northern waters direction. We have been very pleased with her and have taken her to France and the Channel Islands plus been out in some strongish winds without problems. She is fine at 29 knots of wind with two reefs - well balanced and goes nicely. All in all you'll spend quite a lot of time fixing up components that break because they were always too flimsy. For example; someone leant heavily on our saloon table and it ripped off its mountings - the 16 self-tapping screws penetrated all of 1/10 of an inch into the floorboards! I simply had to bolt the fitting through. Also, the lowest companionway panel (which carries the switches and the lowest step) ripped out - again screws too short. If your boat has 1 ¼ " self-tappers (6-off) holding this on I strongly recommend you change them to 1 ½" to prevent you having to spend a Saturday plugging the ripped holes and refixing it - not to mention the possibility of injury. All-in-all, you will curse Jeanneau time and again for not having spent another £2.50 to get a proper part to do the job. In fairness Sea Ventures said this to me before I signed up. Overall, have to believe Bavaria's are more robustly built. 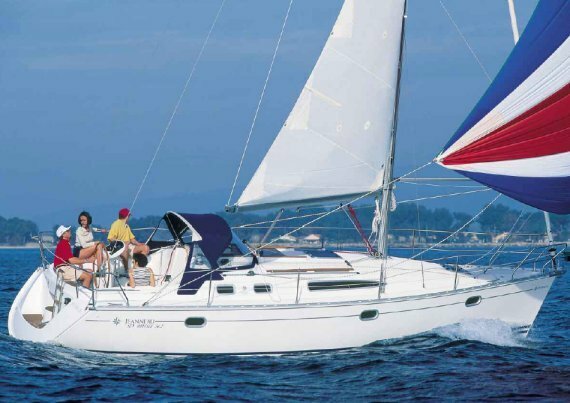 However they don't sail half as nicely as the Jeanneau - we know because we chartered extensively before we bought the SO 34.2.